If the Selkirk Saints only had one player on the ice they wouldn’t be very successful. Here at the Black Bear Review, we like to think of ourselves as Selkirk’s Literary Saints. A team dedicated to a common goal, the publishing of a professional community literary magazine. Much like the Saints, each of our editorial team members has a position to play. Kiala Löytömäki (Editor): Kiala Löytömäki is a third generation queer femme of Sami, German, English and Italian descent. They use the mediums of painting, poetry, writing, ink illustrations and textiles to weave together stories that bring forth messages of healing, pain, grief, beauty, and shadow. Their creations are an everlasting moment where past, present, and future collide and the cycles of birth/life/death are constantly turning. Liv Sapriken (Editor): Liv Sapriken lives in Crescent Valley, but spends much of her time inside her mind creating a world where she can travel from one universe to the next without leaving her bedroom. She is known as someone who can’t follow rules, but prefers to think of herself as someone who knows how to weave through them. A romantic at heart, Liv is looking for submissions that entertain, evoke emotion, and fill her stomach with butterflies. Rhianna Rimmer (Editor): Rhianna Rimmer is a second-year UAS student at Selkirk College. She has lived in the Kootenays for a little over a year and loves being surrounded by mountains and trees. She is passionate about true crime documentaries and podcasts – really anything remotely ghoulish. Riley Polovnikoff (Editor): Riley Polovnikoff lives in Thurms, BC, and is a second-year student at Selkirk College. As an editor for the Black Bear Review, he is looking for emotion in the pieces he reviews – he wants the writing to make him feel. He also believes firmly in a good pen: the Pilot V5 Precise with the hi-tech point is his favourite. When he is not working on schoolwork or writing he could be found moonlighting as a DJ in the Kootenay area. Shelby Rosen (Editor): Born and bred in Castlegar, Shelby Rosen is a second-year Creative Writing student at Selkirk College. When she is not studying or consuming numerous cups of coffee, she may be spotted handwriting out her thoughts and ideas or lost in a novel. She is a sucker for romance and drama and loves being a part of the writing community where vulnerability is valued and connections are always being made. Paige Harwood (Managing Editor): Paige Harwood is a current UAS student at Selkirk College and a two year resident of Castlegar. 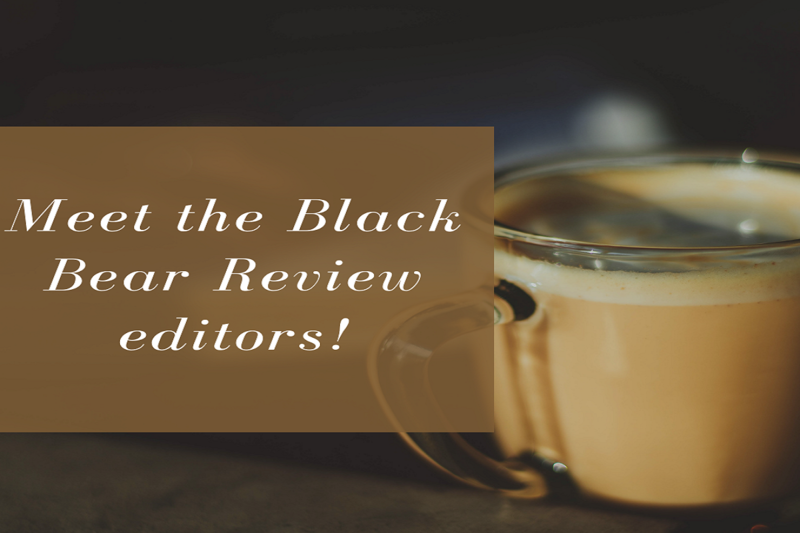 Passionate about both writing and editing, she is excited to be a part of the Black Bear Review’s editorial committee and help foster the talents of future Kootenay authors. It is her goal to see the production of a magazine which offers emerging writers an opening into the often intimidating world of publishing. Almeda Glenn Miller (Faculty Advising Editor): Almeda Glenn Miller is the author of the poetry collection begin with the corners (Big Bad Wolf Press 2014) and novel Tiger Dreams (Raincoast 2002). Her short stories, essays, and poetry have appeared in Prism International, Grain, Dandelion, Event, Room, Antigonish Review, and Ploughshares quarterlies. Her Random Acts of Poetry on Kootenay Columbia is an ongoing project that began in the spring of 2015. She is currently writing a tryptch Novella – Before, During, and After – due 2019. Her other recent projects have included Big Bad Wolf Press, Black Bear Review, and White Buffalo. She has been teaching creative writing and literature at Selkirk College since 2000. Renée Jackson-Harper (Faculty Advising Editor): Renée Jackson-Harper, B.A. (University of Toronto), M.A. (York University), is a PhD candidate in Canadian literature at York University and a faculty member in the departments of English and Creative Writing at Selkirk College. Renée is a faculty advising editor on the Black Bear Review, Selkirk College’s student run literary arts magazine, has served as a founding editor of The Pine Beetle Review at Okanagan College, and as the editor of Uncalibrated Magazine in Jasper, Alberta. Her creative work has been published in The Puritan, Contemporary Verse 2, Prism International, The Goose, Room, Event, The Trinity Review, aired on CBC Radio’s “A Verse to Summer” and on Kootenay Co-op Radio and has been longlisted for the 2015 CBC Poetry Prize and the 2016 Prism International Poetry Prize. Next PostWhat are the Genres of Creative Writing?